Every so often a person of truly extraordinary character crosses our path, someone who has faced life’s most daunting obstacles with rare grace, courage and optimism. 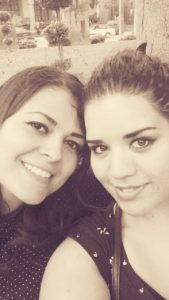 I am honored to know such a person, but she is at a crossroads and badly in need of help. 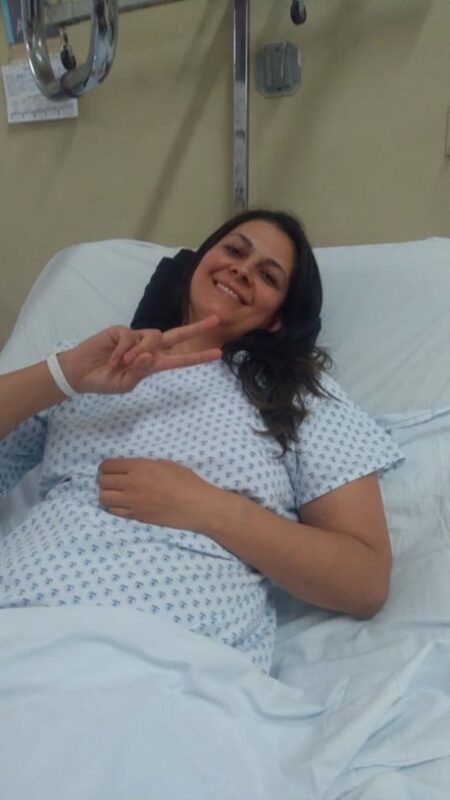 A BICYCLE ACCIDENT AT AGE 12 left Carolina “Caro” Lopez crippled. Upon impact, the bicycle seat apparently broke her femur (thigh bone) and hip, and shoved the bones upward into her abdomen. Her financially strapped parents were unable to obtain first-rate medical help for Caro and her condition steadily worsened. 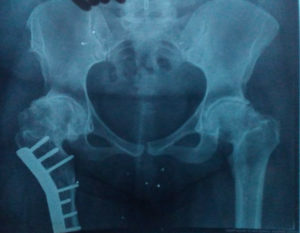 Two years later, with Caro bedridden and her survival at stake, doctors surgically implanted a type of now-obsolete steel plate and screws in a desperate attempt to repair her leg, hips and pelvis. The doctors then told Caro that — if she lived – she’d never walk again, and would never lead a normal life or be able to have children. Although the plate did provide stabilization, Caro was indeed unable to walk. Her muscles had atrophied and her legs had twisted and were virtually useless. DESPITE THE DOCTOR’S DIRE PREDICTIONS, Caro survived, and eventually decided to take rehabilitation into her own hands. After researching the subject, Caro began swimming for hours every day. Over time, the strenuous daily aquatic workouts helped strengthen and straighten her muscles until, eventually (miraculously, in the doctors’ opinions), Caro walked. It was with pain, awkwardly and inelegantly, with limited movement and slightly deformed legs … but she walked! And though deprived of activities that were normal for most young women, Caro smiled and got on with her life! 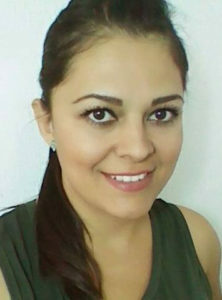 YEARS LATER CARO MARRIED and started working toward a university degree in Psychology in Guadalajara. It was a positive, seemingly productive time in her life. She enjoyed her classes and made friends. My daughter-in-law Zuzu became her best friend, which is how I came to know Caro. I was immediately captivated by her warm heart, cheerful disposition and positive attitude. Ten years into her marriage, Caro’s husband decided he wanted children after all, which Caro was unable to give him. So he left her. She tried to remain in college, but about halfway through her course of study she was forced to drop out and work to support herself. FOR THE NEXT FEW YEARS, Caro worked at various jobs and at a serious relationship with a new man in her life. Then a little over a year ago — much to everyone’s surprise — Caro discovered she was pregnant. Wow, big surprise is an understatement!! She was ecstatic! Being a mother was a seemingly unattainable, lifelong dream. It was the happiest moment of her life, full of joy and promise. The longtime boyfriend saw things differently. Unlike her former husband, the boyfriend had no desire to become a dad. When he found out Caro was pregnant, he made a quick exit from her life. With a bolted pelvis, hip and leg, carrying a baby was no easy task. But it seemed nothing could dampen Caro’s happiness over her coming child. Being pregnant and unable to work, she moved back in with her mother and father. Although she had never shared a closeness with her mother, her father was a lifelong champion. Shortly afterward, Caro’s beloved father – her lone familial ally — was diagnosed with cancer. He died in Caro’s fifth month of pregnancy. His loss was devastating. Only the soon-to-be-born baby made his loss bearable. ON NOV. 10, 2017, AT FULL-TERM, a beautiful baby boy was born by cesarean section. Caro named him Gael Alexander. 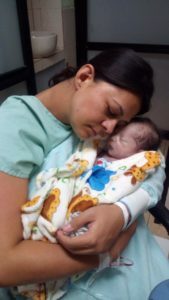 Tragically, due to a rare heart defect, little Gael wasn’t destined to live. With his heart slowly failing, Caro held him in her arms and sang to him until he died the following day. There are no words to describe the depth of loss and despair Caro suffered. SO, HERE WE ARE IN 2019. Caro lives alone and supports herself by working in the kitchen of a local restaurant, where she can remain seated. Her salary is $1200-pesos (about $60 dollars) a week. The 22-year-old plate and screws in her leg were never meant to be anything but a short-term fix. The passage of time, combined with the strain of pregnancy and childbirth, is causing Caro’s bones to disintegrate. Naturally, this means her pain level is increasing dramatically. Without surgery, doctors say, the bones will continue to crumble, and she is facing life-threatening infection and possibly amputation. Doctors and orthopedic surgeons at the Hospital Civil envision a pain-free life with near full mobility for Caro, IF – in a series of three surgeries — she has the metal plates removed and both hip joints (which are collapsed) replaced as soon as possible. T he urgency of her situation has helped move her toward the front of the line medically speaking. Recent tests indicate that Caro is an excellent candidate for double hip replacement surgery. Fortunately, a portion of costs for these very expensive surgeries will be covered by the Hospital Civil and Mexico’s Seguro Popular healthcare program. However, many associated costs — including the prosthetic hip devices — are not covered, and are completely out-of-reach on Caro’s meager earnings. IN WRITING CARO’S STORY, it is my hope that some of the many kind and generous people in our community and beyond will choose to open their hearts and their wallets to help Caro obtain the surgeries that offer a normal, mobile and pain-free life. In order to cover expenses such as the two prosthetic hips, medications, lab tests, transportation, blood transfusions, physical therapy, lost wages, raised toilet seat and other devices, etc. an estimated $8,000 USD is needed. If you would like to donate, funds can be sent to Caro via the means shown below. 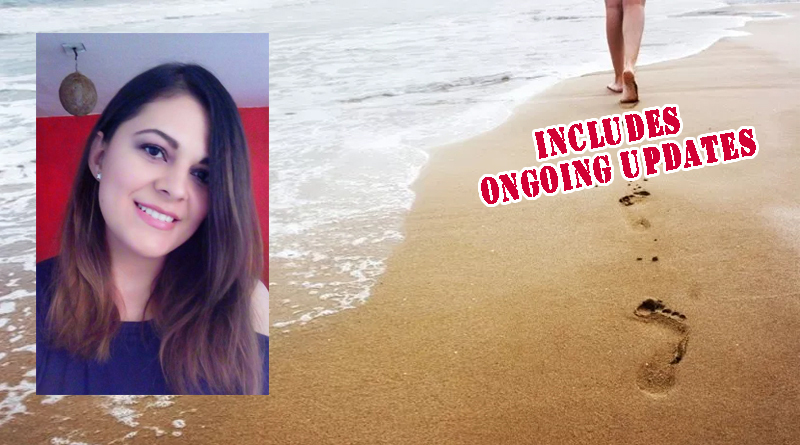 If you are unable to donate, your prayers and well wishes for Caro are sincerely appreciated, as well as a LIKE and SHARE of her Facebook page. • Facebook page Ayuda a Caro a Caminar (Helping Caro to Walk). Today Caro was let go from her $60-dollar-a week, sit-down job in a local restaurant kitchen due to her boss’ growing worry over her fragile condition. So she now owes rent, utilities and medical bills and has no income at all. So, if anyone out there has or knows of any type of work she can do from home (or that requires little standing or walking), please let us know. Caro is educated, very intelligent and personable. She would make an excellent front desk receptionist, for example . Carolina entered the Hospital Civil today for her first surgery tomorrow. She is in a ward-style room with about 20 other patients. 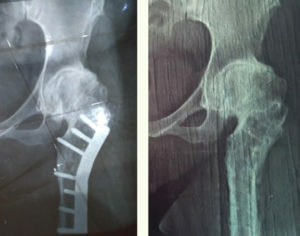 This surgery is to remove the metal plate and screws on her femur (thigh bone). Surgeons report having rented special tools to remove bone that has grown around the metal over the past 22 years. 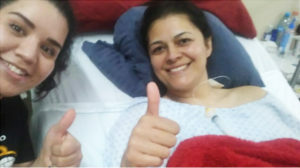 Caro is in good spirits and friends will be taking turns caring for her ‘round-the-clock, as is standard in many Mexican hospitals with limited nurses. 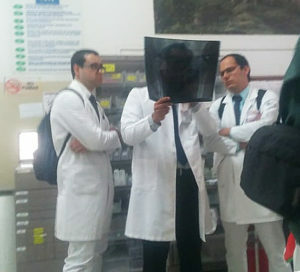 Several members of Caro’s team of doctors (Drs. Arguelles, De La Torre, Gomez, Cardenas, Enriquez, Magallon and Fregoso) discuss her X-rays. best for her. Then we will have a better estimation of the costs Caro will have to pay. Doctors want to wait six months for the fragile bone to mend and fill in the gaps left by the metal rod and screws. 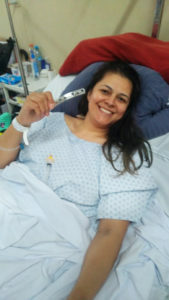 This gives her six months to come up with funds to do the first total hip replacement. We might mention one other need, a raised toilet seat that we are told would be very helpful for Caro. If anyone has one they could donate or lend or sell at a low price, please contact us. Thank you all!! P.S. Due to a technical error with Paypal (an extra period in the email) several donations to Caro did not go through and were refunded. It is all set up and working correctly now, but if you made a donation prior to last night, please verify your refund and re-issue your kind donation. Thanks and very sorry for the bother. Caro (R) and best friend Zuzu (L) after surgery to remove the metal plate and screws. Doctors want to perform the first total hip replacement in six months, after the femur has mended. Caro ‘s 5-hour surgery to remove the metal plate and screws was a success. 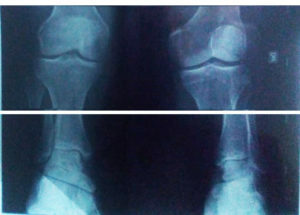 After the surgery, her team of doctors at the Hospital Civil commented that when they first opened up her leg, no metal at all was visible; bone had completely grown over it. Fortunately, they had foreseen that in advance, and rented tools to chip away the bone and remove the screws. Caro was released from the hospital last nite. She was brought to Zuzu’s (her best friend’s) house for recovery care. Getting Caro up a full flight of stairs was no easy task, but Caro took her time and inched up using one leg and her arms. Prescribed medications (Tramadol, Desketoprofeno, Xarelto, Cefalexina, etc.) and wound treatment supplies totaled well over $3000 pesos, but contributions covered this expense. She is to return to the Hospital Civil for progress assessment in 2 weeks. P.S. A needed raised toilet seat has been donated by a very kind person in Tlaquepaque. We only need to go pick it up. Shortly we plan to print the names of all who are helping. Thank you to everyone! A full week has now passed since Caro’s first surgery where doctors removed the metal plate and screws implanted as a youngster. She is being cared for in the home of her best friend, Zuzu, and is recovering nicely. One more week and she will have the stitches removed. To date, donations received have gone toward the required patient portion of the first surgery and hospital costs, post-op medications, and a very used but still serviceable recliner. A wheelchair and walker have been lent to her, and a raised toilet seat has been donated. In retrospect, when she was released from the hospital, we wish we had videotaped her valiant trip from the car to the upstairs duplex where she is staying. It would have been movie-length, but Caro did it all, inch-by-inch, with just one leg and an occasional shoulder to lean on. She was shaking at the top of the stairs, but victorious! Although she cannot (and has been instructed not to) put any weight at all on her left leg yet, she is getting around a little with the aid of the walker. The leg is very delicate at this point, being riddled with holes previously occupied by the plate and seven large screws. But every day she can bend the leg a little more, and is looking forward to full and pain-free mobility after the next surgeries, one is six months and the other in a year. For more information, updates and a complete list of needed items and estimated expenses, follow Caro’s facebook pages. Thank you all!